Vancouver's newest "hood"! Yaletown is in many ways a typical "shake and bake" neighborhood to use a term from one of my favorite movies, Aliens. In the movie the term is used to describe an outer-world colony that is introduced to a hostile toxic planet in order to slowly change it's climate. Everything is supplied and ready-to-go right out of the box right down to the local tavern, that is - until the Aliens crawl out of their hiding places and pod everyone. Like the colony in the movie, Yaletown with it's uniform concrete towers, and high-gloss but not long established businesses has a similar feel at times; a wasteland colonized by new hopefuls slotting into the available deal. A tremendous amount of money has been spent on concrete, wallboard and plumbing fixtures, schools have been built, liquor stores have been put in, there's even going to be a Light Rail Station. Living on the 5th floor I don't have a Spectacular City/Mountain View as some in these towers do, but the view out my window is pretty nice. I get a little space in the centre and lots of light. One of the most surprising aspects of the neighborhood is it's lack of people mulling about between the hours of 9 and 5. I think a large proportion of the populace are not "out on the street" types, but are generally working in other towers downtown or maybe even commuting to the suburbs. At times, the absurdity of a place so densely populated and abandoned has an eerie vibe. Freshly watered flower gardens shine at no-one and cheap fountains bubble-away meaninglessly in empty courtyards. At first I imagined that most of the people living down here were young, hip students and go-getters who were not inclined to, or just too cool to, raise kids in the obvious confined space of 700 square feet or less. While this is kind of true I now realize there there are a fair amount of youngsters down here too. I guess a small condo is the new "starter home" for a family. I sometimes see kids running around in the common area of some gated complex and being from the countryside I wonder how it must be growing up with thousands of people all stacked up around you and looming towers everywhere. I guess it could be kind of fun in some ways, but it seems so much of the Vancouver downtown nightlife is not geared for kids. Perhaps the real test for this place will come from these youngsters. What will they think of their home-neighborhood when they reach the age of 14? Will they snort at it's mention the same way hipsters do on Commercial Drive and Main St? 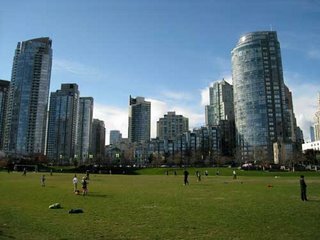 Will Yaletown be recognized for being the new Port Coquitlam or South Delta; a place you escape from? 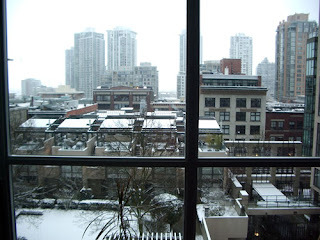 It does seem strange to even ponder such deep questions in relation to a place like Yaletown. It's like wondering if the Mall is a great social experiment. In the end, it's still just the Mall, making thoughtful observations doesn't change it's nature. I don't think anyway. 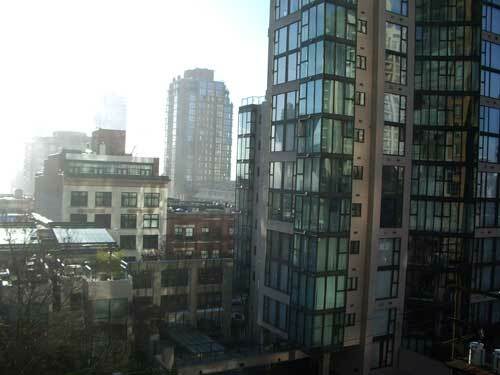 The towering glass forest of Yaletown is comprised almost exclusively of similar and modern high-rise apartment towers mostly built within the last 10 years. - and the building continues. Despite the gloomy prospects of real estate market collapse in the US and predictions of an Olympic fueled hype "bubble" in Vancouver, developments are still going up in Yaletown. 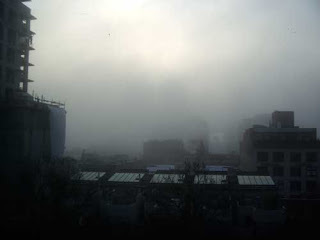 My Dearest Clay, I just read your thoughts about Yaletown. You made me laugh, but at the same time I felt sad. Yaletown is like Santa Fe next to Ibero University, remember? You should write a book. My friend Isa, the librarian of the school I work in, always reads your blog. She loves it. We insist, write a book! I love you dudorrinoh, and I miss you. When are you coming to Mexico? Please convince Haley to come. We will drink fresh juices and eat tlacoyos non-stop! Hi Clay! I'm Isa, Adri's friend. I met you twice, I think, but I remember you well. I liked you instantly. She told me about your blog and I read from time to time. You're a really good writer. So descriptive. I've recommended your blog to Canadian friends who want to know more about Mexico. Thanks! Keep writing and take care. All the best!